As the solar wind flows from the sun, it creates a bubble in space known as the "heliosphere" around our solar system. 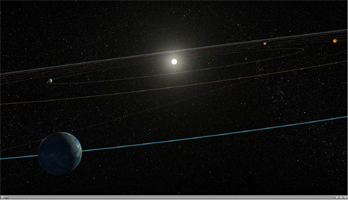 The heliosphere is the region of space under the influence of our sun. The interstellar medium, the matter that fills the local region of our galaxy, is forced to flow around the heliosphere. It disturbs the solar wind so much as to create a secondary bubble around the heliosphere known as the heliosheath, which is filled with heated, slower solar wind. Scientists on the Cassini mission used the Ion and Neutral Camera sensor on the Magnetospheric Imaging Instrument to look at the interaction of these plasma bubbles with the interstellar medium. The scientists also looked at how the heliosphere and heliosheath move through the interstellar medium together. The sensor on Cassini detects hot particles known as energetic neutral atoms at high energies, complementary to instruments on the NASA Interstellar Boundary Explorer mission. This animation starts with our sun and pulls out to show us the heliosphere (gray) and the heliosheath (yellow) of our solar system. As the animation zooms away from the sun, it shows an artist's concept of the interstellar medium (in black arrows) flowing past the heliosheath. The interstellar magnetic field (smoky gray vertical stripes) parts and slides around the bubble of hot, high pressure particles. The interstellar medium contains the bubble and holds it in a more spherical configuration. The colors on the heliosheath represent the intensity of the hot high pressure particles, with red being the most intense, highest pressure. The shape of our solar system moving through the interstellar medium was previously thought to be comet-shaped, with a head pointed into the stream, and a tail flowing downstream. New observations show the shape actually resembles something more like a slippery ball (the hot particles that exert pressure) moving through smoke (the interstellar magnetic field). As the "ball" moves through the "smoke," the smoke bends and parts to let the ball through, then resumes its previous shape after the ball has passed on. At present, this is only hypothetical: New models will be motivated by these measurements, and will provide a more physically accurate basis for the interaction of the heliosphere with the interstellar medium. The Cassini-Huygens mission is a cooperative project of NASA, the European Space Agency and the Italian Space Agency. The Jet Propulsion Laboratory, a division of the California Institute of Technology in Pasadena, Calif. manages the mission for NASA's Science Mission Directorate, Washington, D.C.